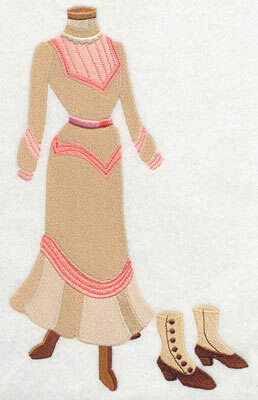 Fashion in the 1900s was defined by elegant lines and conservative lengths. 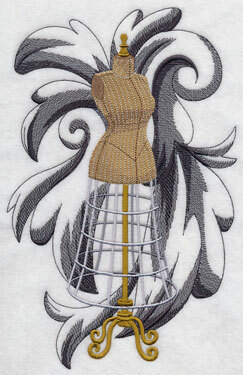 Tall stiff collars and long skirts giving off a columnar silhouette were extremely popular, and inspired this dress form design. 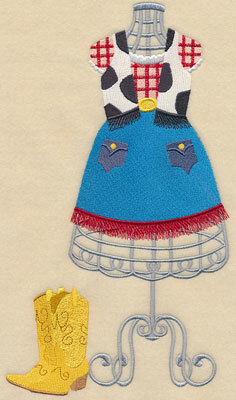 Pair it with a classic 1900s sewing machine (this version was based off the Starley 'Queen of Hearts' machine). 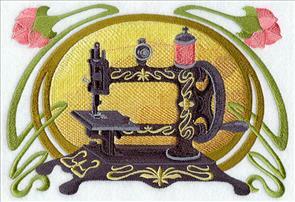 6.90" x 11.01" and 5.85" x 9.33"
9.70" x 6.85" and 8.30" x 5.86"
7.52" x 5.31" and 6.85" x 4.84"
Fashion from 1910-1919 featured more of a rich and luxurious look in contrast with the previous decade's traditional approach. 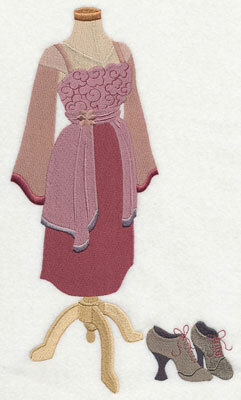 Skirts rose from floor-length to above the ankle, and opulent fabrics and details were included in apparel. 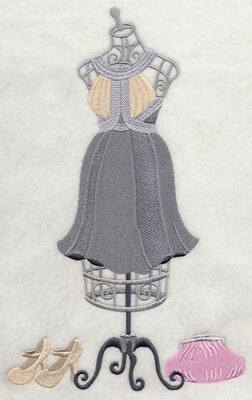 Stitch this 1910s dress form alongside the corresponding sewing machine, based off the Wertheim S68 'Superba D'. 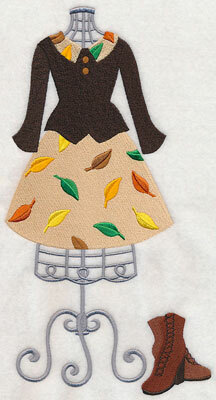 Great on crafty and fashion projects! 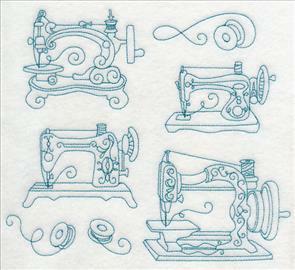 6.88" x 11.74" and 5.51" x 9.40"
9.48" x 6.88" and 8.06" x 5.86"
7.30" x 5.30" and 6.60" x 4.79"
The Roaring '20s were the age of flapper dresses, art deco-inspired details, and the Singer Model 128 sewing machine. 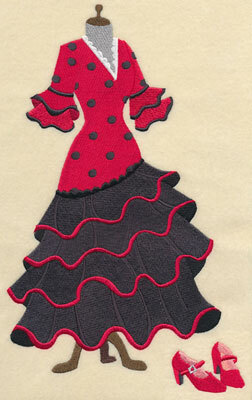 The style was naturally slimming, and a revolt against the conventional styles of the past. 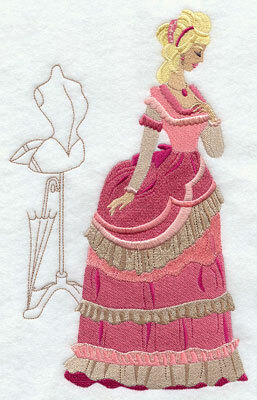 Add this pair of 1920s designs to either side of a tote bag, a pair of pillows, or to update your sewing room decor. 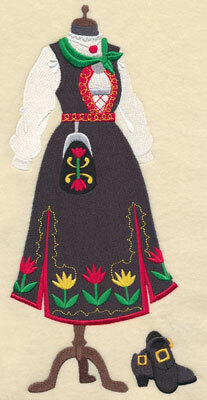 6.33" x 11.73" and 5.07" x 9.38"
9.31" x 6.91" and 7.92" x 5.87"
7.21" x 5.34" and 6.57" x 4.86"
The 1930s signified a movement back toward a more conservative look due to the Great Depression. 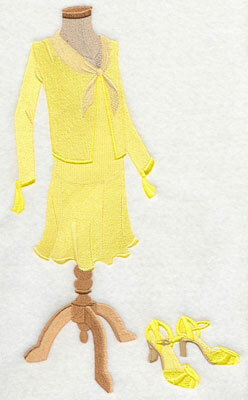 Skirts got a little bit longer, and outfits imparted a flowy, feminine look. 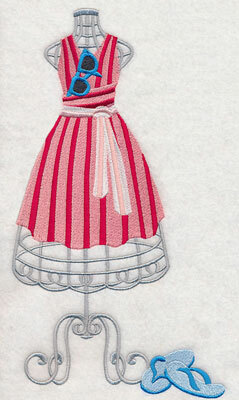 Pair the 1930s dress form with this sewing machine design, inspired by the 1930s Universal Sewing Machine. 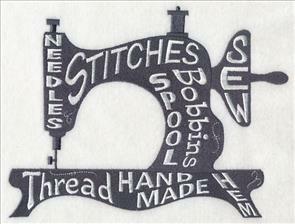 6.89" x 11.54" and 5.61" x 9.38"
8.26" x 6.90" and 7.38" x 6.16"
6.41" x 5.36" and 5.78" x 4.83"
World War II had a major impact on 1940s fashion. 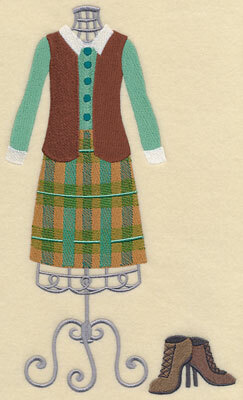 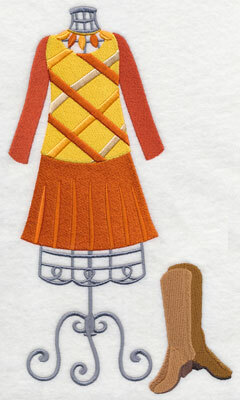 Women wore skirts at knee-length, with simply-cut blouses and wide-shouldered jackets. 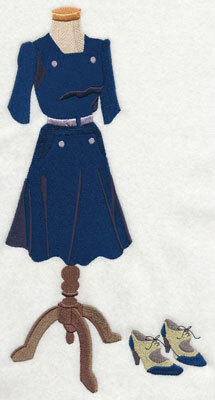 Many women's clothes were repurposed from the suits of men in uniform, as the cloth would be otherwise unused. 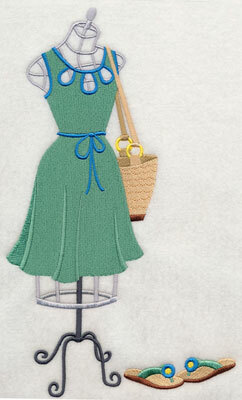 Use this dress form design alone, or stitch with the 1940s Bel Air Imperial-inspired sewing machine design on your next embroidery project! 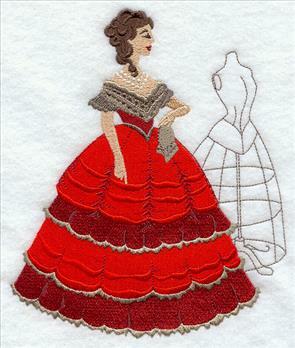 9.14" x 6.85" and 7.81" x 5.85"
7.14" x 5.35" and 6.48" x 4.86"
The 1950s were defined by the soft femininity of full skirts, fitted waists, and rounded shoulders. 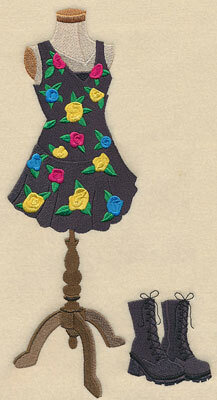 Bright colors and prints were returned to after the solemnity of wartime. 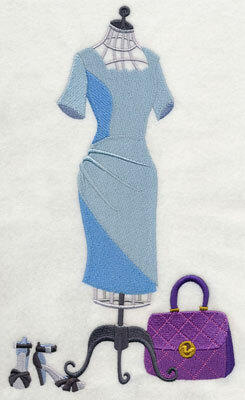 This dress form design is fabulous stitched in conjunction with the corresponding sewing machine, modeled after the 1950s Singer Model 201K. 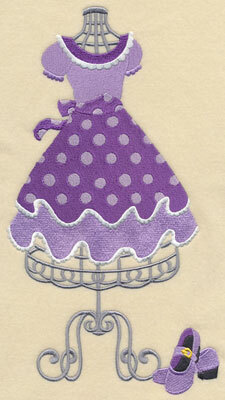 Add to totes, pillows, and more! 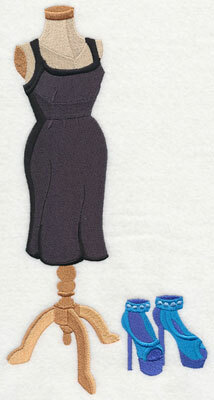 6.77" x 11.70" and 5.43" x 9.38"
9.24" x 6.87" and 7.80" x 5.80"
7.16" x 5.32" and 6.51" x 4.84"
Fashion in the 1960s followed in the footsteps of social movements during that time, and broke many traditions. 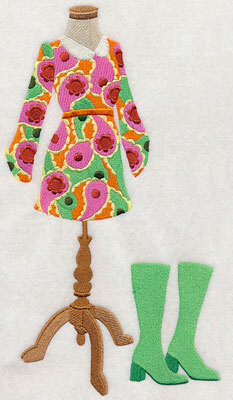 Go-go boots, bright and colorful prints, and Mod silhouettes were found in closets all over during this time. 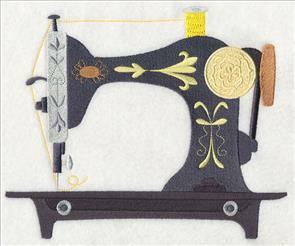 This 1960s sewing machine is based off the Singer Touch & Sew from this decade, and features the colors and style of that era. 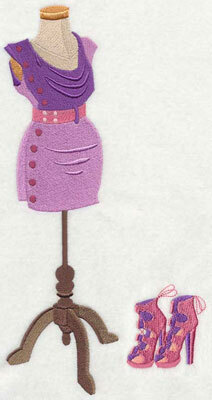 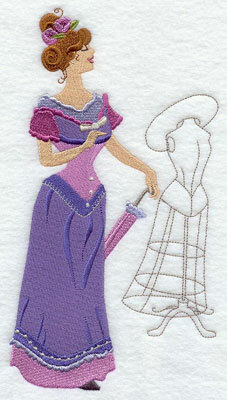 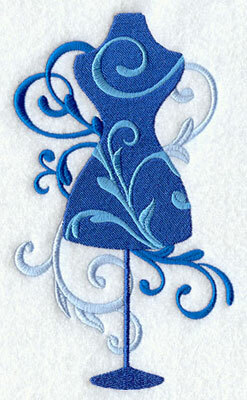 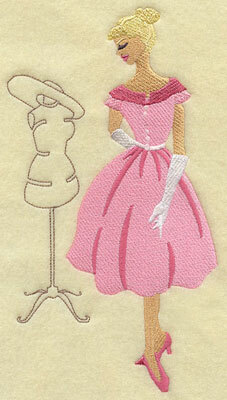 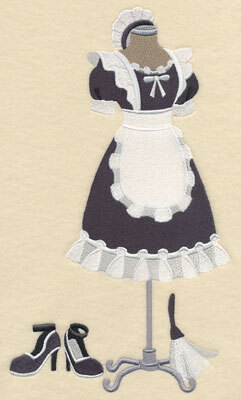 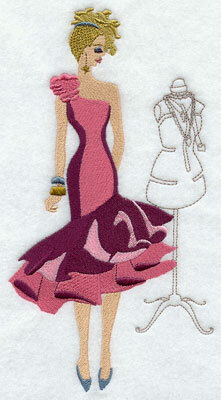 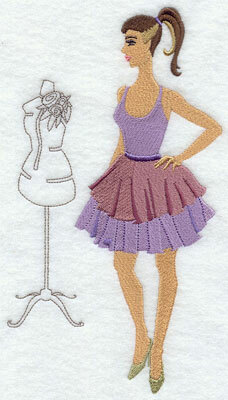 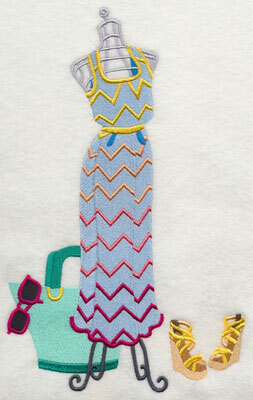 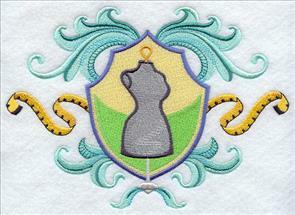 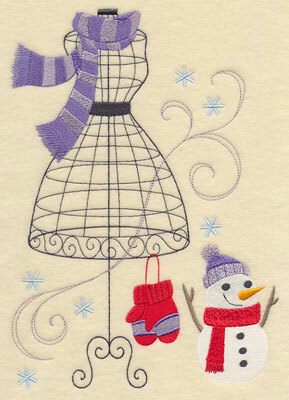 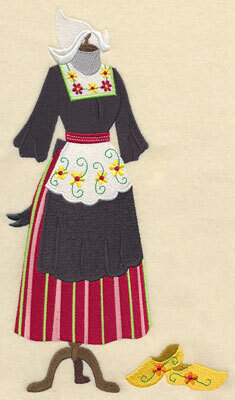 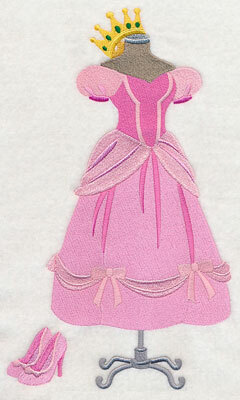 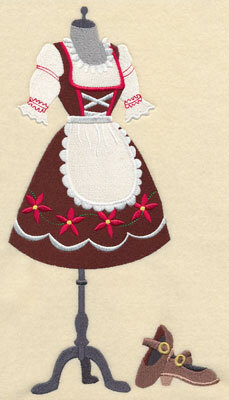 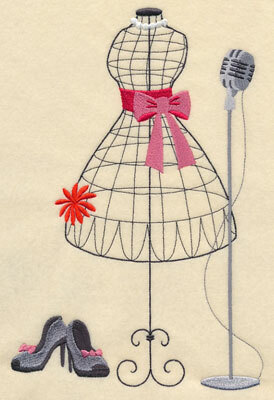 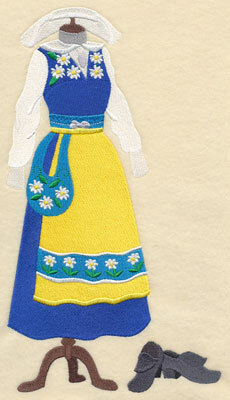 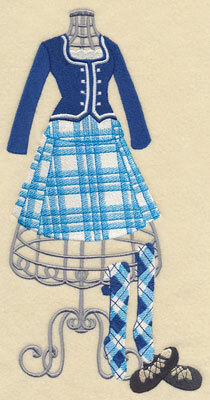 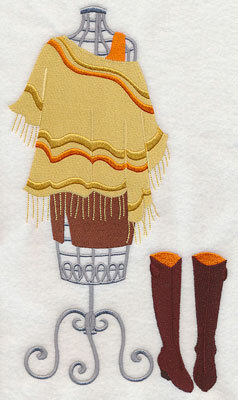 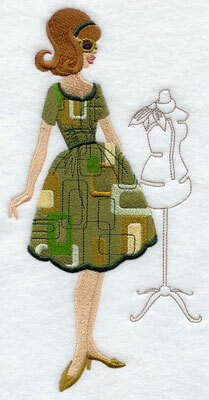 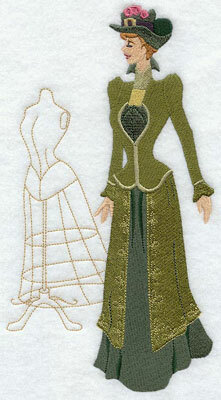 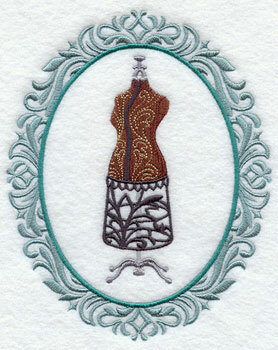 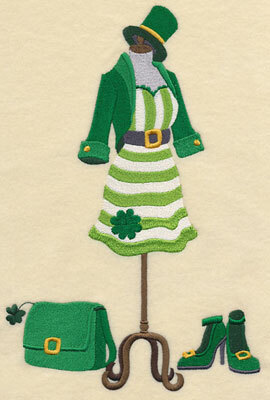 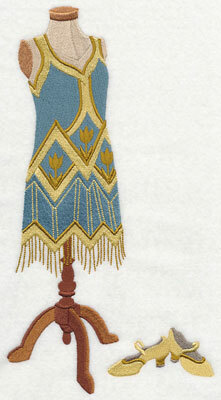 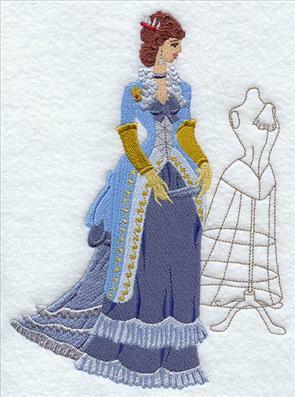 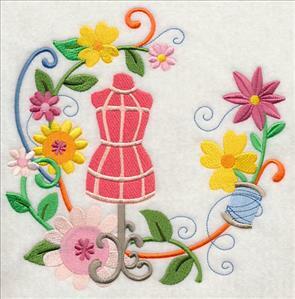 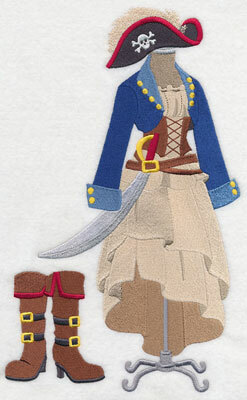 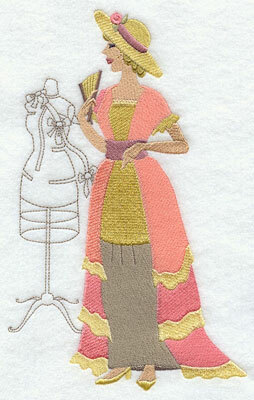 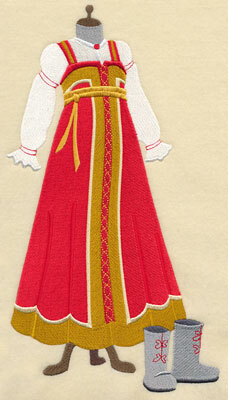 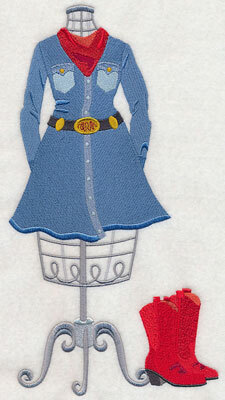 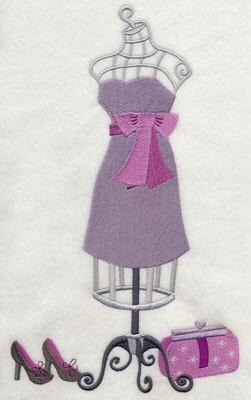 Stitch alongside the dress form on your next embroidery project! 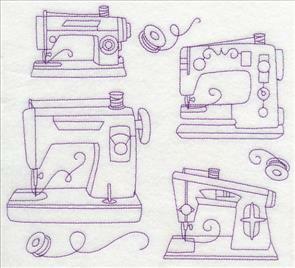 6.77" x 11.73" and 5.41" x 9.38"
9.00" x 6.89" and 7.78" x 5.95"
7.00" x 5.36" and 6.35" x 4.86"
The "hippie" look was a staple in many 1970s wardrobes, featuring folk-inspired long dresses, earthy prints, and bright, floral patterns. 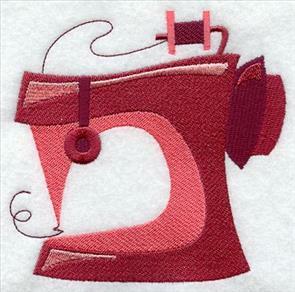 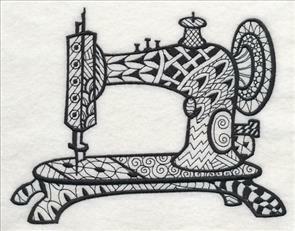 The Elna Supermatic was a well-known sewing machine during the 1970s, and was the inspiration behind this sewing machine design. 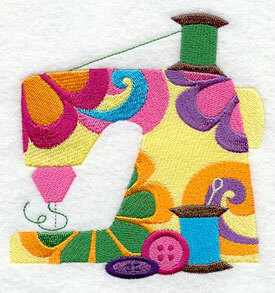 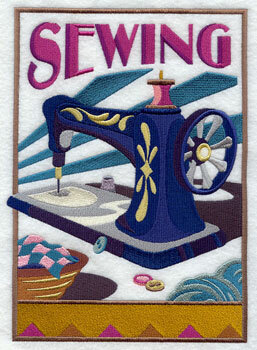 Stitch in coordination with the colorful 1970s dress form on apparel, wall hangings, or sewing machine cover. 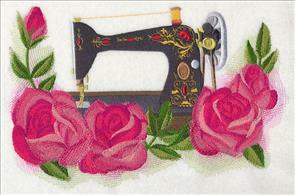 6.91" x 11.19" and 5.80" x 9.40"
8.22" x 6.86" and 7.21" x 6.06"
6.36" x 5.35" and 5.78" x 4.86"
Bright, vivid colors, an emphasis on volume and accessories, and extravagant details imparted the 1980s with its iconic fashion. 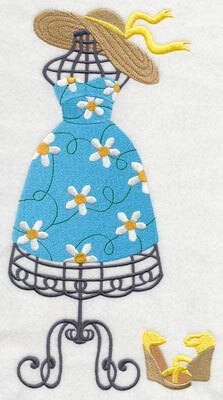 The bold and creative approach stemmed from a reaction against the earlier decades' hippie movement and the popularity of pop stars' fashion choices. 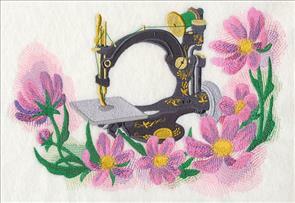 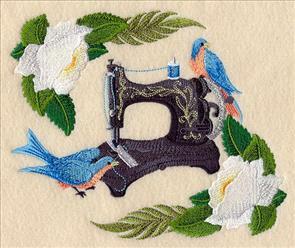 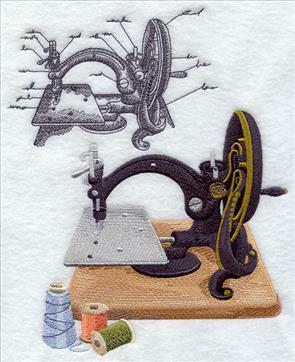 During this decade, the Singer 6136 sewing machine was extremely popular. 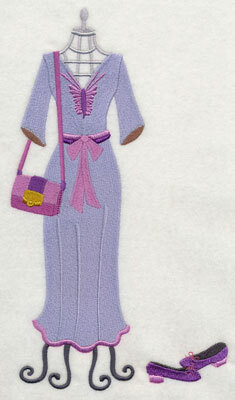 This design is modeled after that machine, and is a fabulous accompaniment to the '80s dress form. 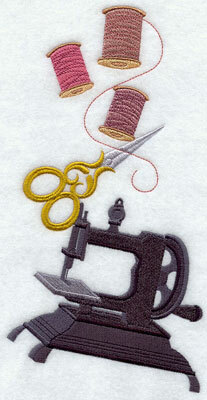 6.84" x 11.75" and 5.48" x 9.40"
8.09" x 6.90" and 7.46" x 6.36"
6.87" x 5.86" and 5.70" x 4.86"
For most of the 1990s, fashion returned to a more minimalistic approach after the boldness of the '80s. 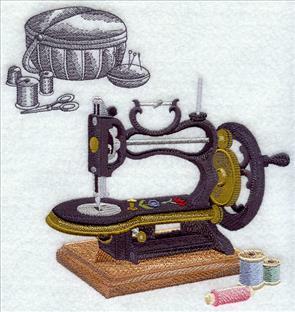 The popularity of grunge and rock music led to an anti-conformist approach to fashion, signified by t-shirts, jeans, hoodies, and short slip dresses. 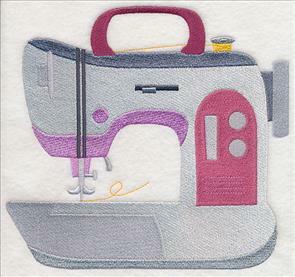 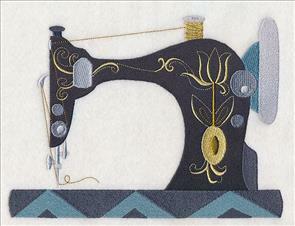 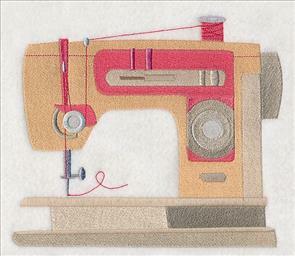 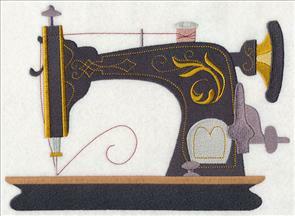 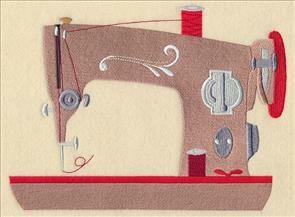 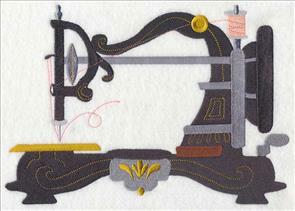 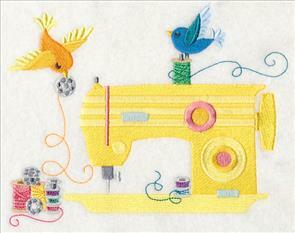 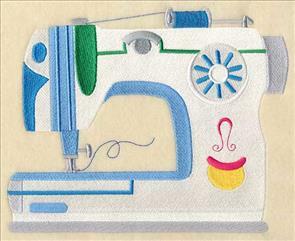 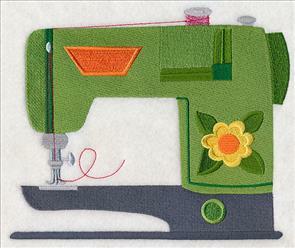 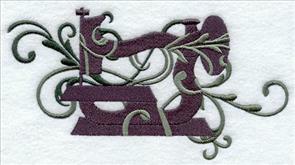 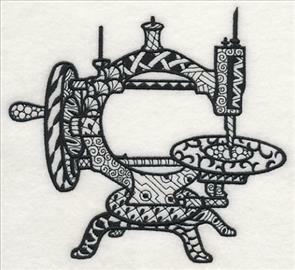 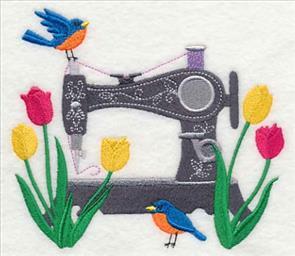 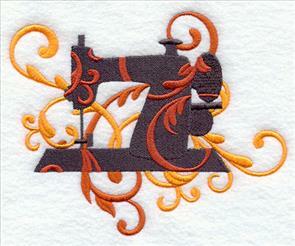 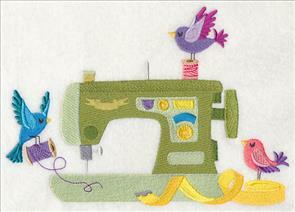 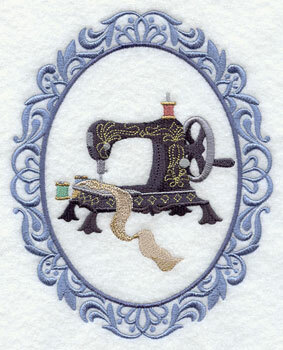 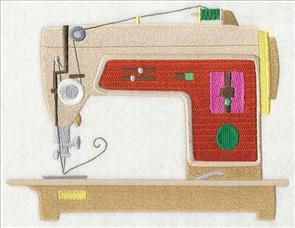 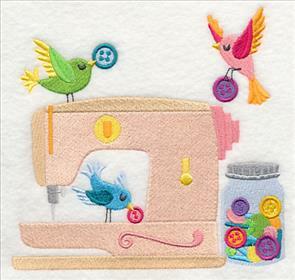 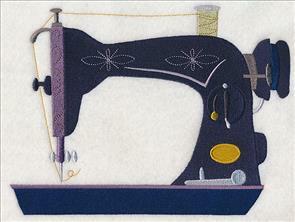 Sewing machines during the 1990s began to move toward what they look like today. 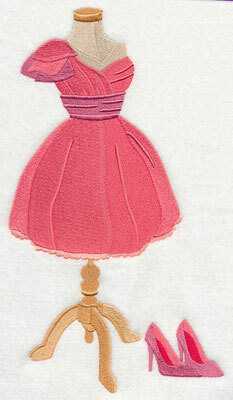 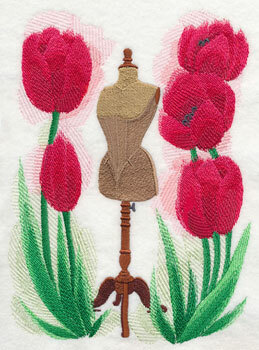 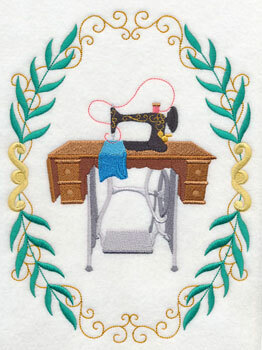 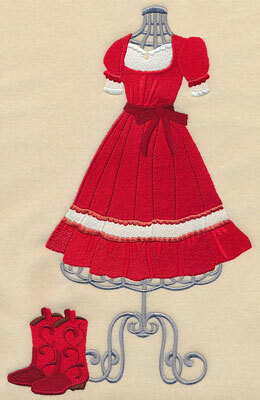 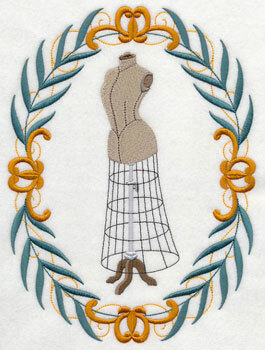 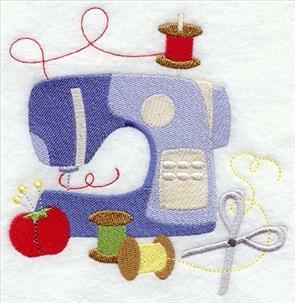 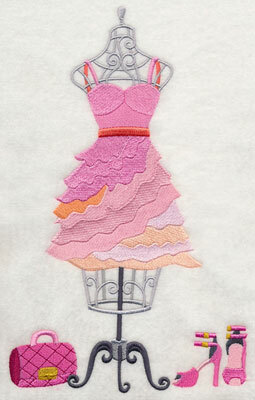 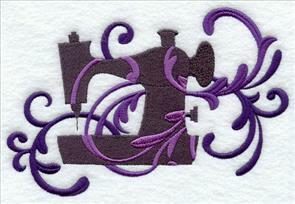 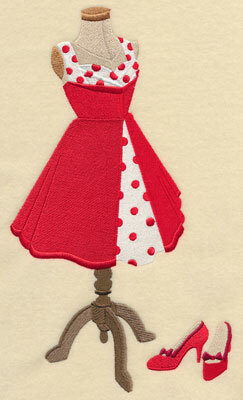 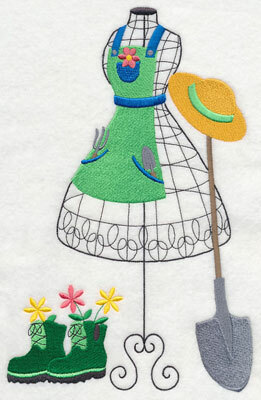 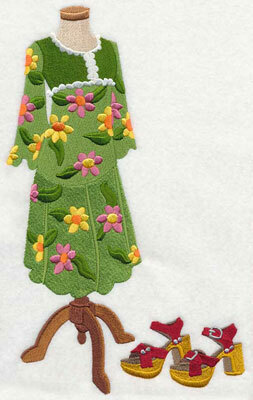 Stitch this dress form and sewing machine pair on framed pieces, wall hangings, quilts, and more. 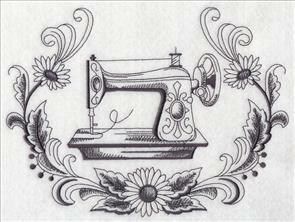 6.10" x 11.75" and 4.88" x 9.40"
8.58" x 6.90" and 7.81" x 6.28"
7.02" x 5.65" and 6.02" x 4.84"
Many fashion trends during the 2000s were inspired by reviving clothes from the previous decades, and contain a mix of earlier fashion trends. 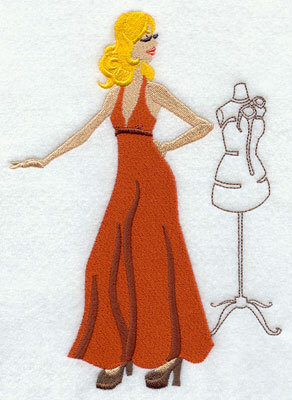 This dress form design features a classic 2000s silhouette and popular "little black dress" style. 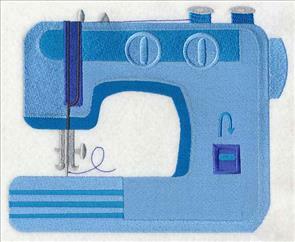 Stitch alongside a modern 2000s sewing machine -- they're fabulous additions to sewing room decor, fashionista-theme projects, and more. 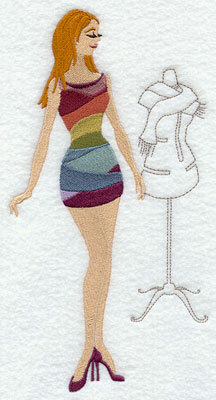 6.12" x 11.75" and 4.90" x 9.40"
8.42" x 6.90" and 7.71" x 6.32"
7.01" x 5.76" and 5.91" x 4.85"
This dress form design features the current fashion styles, including the bright color scheme and accentuated waist found in many dresses of this decade. 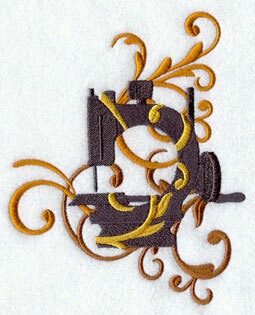 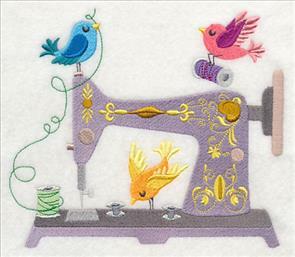 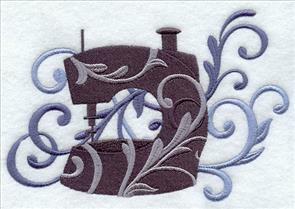 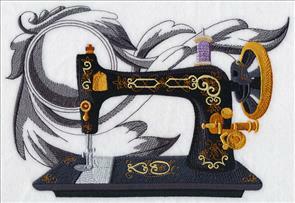 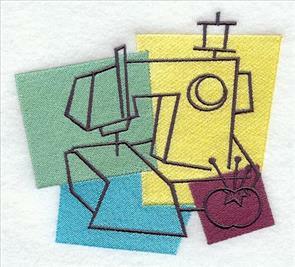 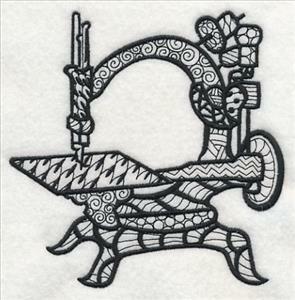 A modern sewing machine design is based off the current styles of machines, and is the perfect motif to stitch with the 2010s dress form. 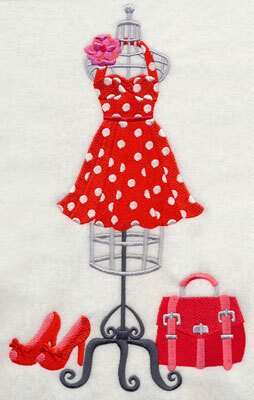 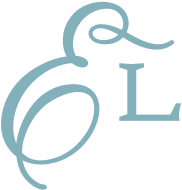 Add to tote bags, garment bags, and more. 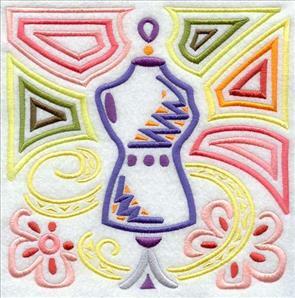 7.81" x 7.25" and 7.26" x 6.74"
6.31" x 5.86" and 5.24" x 4.86"
These dress form and sewing machine designs will add a stylish and sophisticated look to any embroidery project! 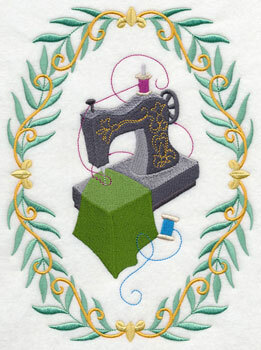 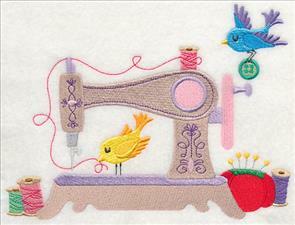 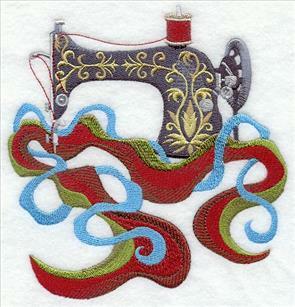 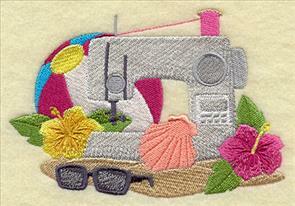 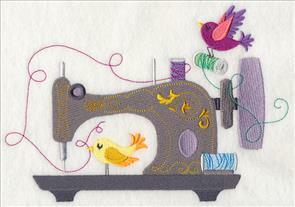 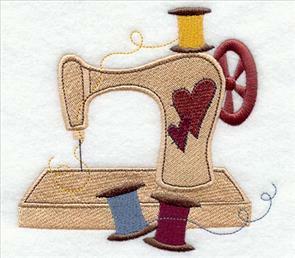 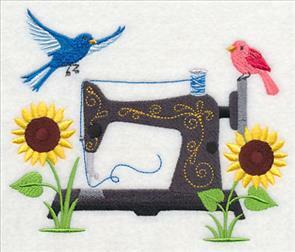 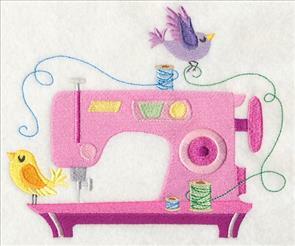 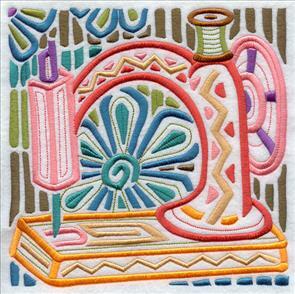 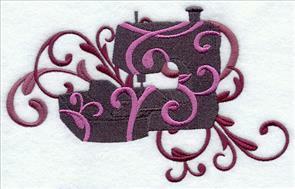 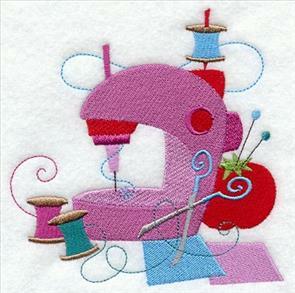 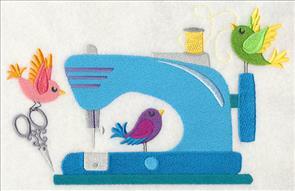 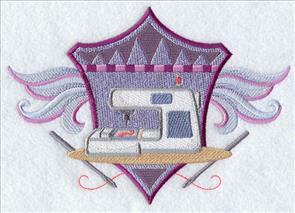 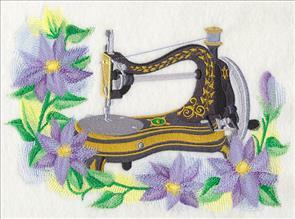 Stitch them together on a quilt or series of wall hangings, or pick your favorites for a fabulous look. 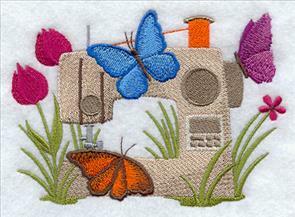 Purchase the crafty designs individually by clicking the links above. 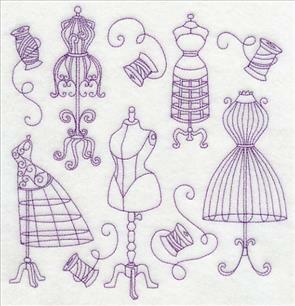 Or, get all 12 dress forms or all 12 sewing machines in a pack. 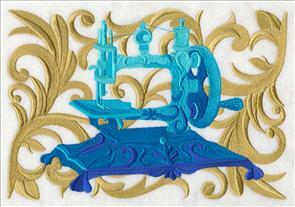 Click on a link below to see the designs in the packs, and add the packs to your cart. 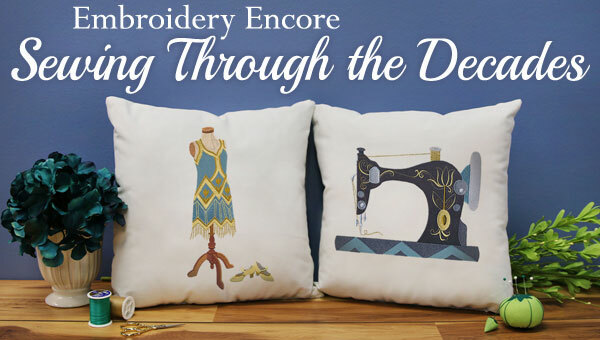 These Sewing Through the Decades designs are entirely brand new, and are fun additions to our growing collection of dress form and sewing machine designs. 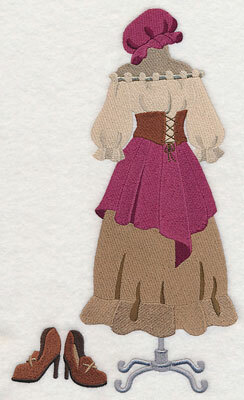 In addition to these new designs, we've added over 100 other beautiful machines and dress form designs to this weekend's sale! 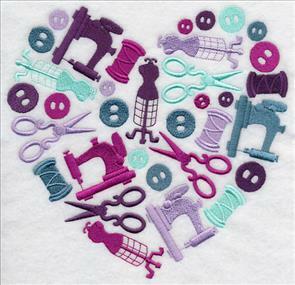 Dress forms and sewing machines in a wide variety of styles and sizes are beautiful additions to totes, pillows, and other sewing room decor. 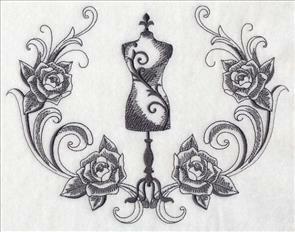 Ranging from blackwork to filigree, art deco to floral-inspired, there's something for everyone! 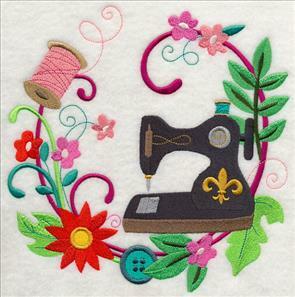 Scroll down to see the excellent variety. 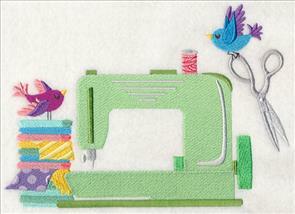 6.90" x 11.01" and 5.86" x 9.33"
5.88" x 11.75" and 4.70" x 9.41"
3.90" x 7.80" and 3.43" x 6.87"
6.90" x 11.49" and 5.65" x 9.41"
6.90" x 11.14" and 5.83" x 9.41"
4.83" x 7.80" and 4.25" x 6.86"
6.89" x 11.63" and 5.57" x 9.40"
6.88" x 11.42" and 5.65" x 9.38"
4.70" x 7.81" and 4.14" x 6.87"
6.90" x 10.90" and 5.85" x 9.24"
6.90" x 11.63" and 5.59" x 9.41"
4.63" x 7.80" and 4.07" x 6.86"
6.89" x 11.06" and 5.82" x 9.33"
7.42" x 5.85" and 6.14" x 4.85" and 3.85" x 3.19"
5.86" x 5.86" and 4.88" x 4.88" and 3.87" x 3.87"
6.43" x 5.86" and 5.32" x 4.85" and 3.89" x 3.54"
1.85" x 6.79" and 1.05" x 3.85"
8.88" x 6.85" and 7.59" x 5.86" and 6.30" x 4.86"
8.92" x 6.90" and 7.59" x 5.87" and 6.27" x 4.85"
7.42" x 7.80" and 6.88" x 7.24"
5.86" x 6.17" and 4.86" x 5.10"
10.10" x 6.88" and 8.59" x 5.86"
4.98" x 7.82" and 4.37" x 6.85"
4.05" x 6.80" and 2.31" x 3.85"
4.83" x 5.95" and 3.14" x 3.86"
6.82" x 4.60" and 3.86" x 2.63"
6.81" x 4.26" and 3.86" x 2.43"
7.81" x 7.78" and 6.90" x 6.87"
5.86" x 5.84" and 4.85" x 4.83"
7.81" x 7.79" and 6.90" x 6.90"
4.81" x 4.86" and 3.82" x 3.86"
4.84" x 5.01" and 3.73" x 3.86"
5.39" x 4.83" and 3.85" x 3.48"
4.84" x 5.01" and 3.73" x 3.85"
8.58" x 5.86" and 6.87" x 4.69"
7.06" x 5.85" and 5.85" x 4.84"
5.48" x 4.84" and 3.86" x 3.40"
5.37" x 3.71" and 3.85" x 2.67"
6.74" x 7.82" and 5.86" x 6.81" and 4.88" x 5.69"
7.80" x 7.48" and 6.90" x 6.61"
6.09" x 5.84" and 5.04" x 4.84"
6.99" x 9.67" and 5.62" x 7.78" and 4.86" x 6.73"
7.79" x 5.54" and 6.81" x 4.86" and 3.86" x 2.77"
5.86" x 7.33" and 4.86" x 6.08" and 3.09" x 3.86"
4.83" x 6.51" and 2.87" x 3.86"
10.01" x 6.89" and 8.51" x 5.86"
7.80" x 5.37" and 6.87" x 4.73"
6.90" x 11.16" and 5.82" x 9.40"
6.68" x 11.72" and 5.36" x 9.39"
4.46" x 7.82" and 3.92" x 6.87"
6.27" x 11.71" and 5.04" x 9.41"
4.27" x 7.80" and 3.75" x 6.86"
6.90" x 10.45" and 5.85" x 8.86"
6.87" x 9.68" and 5.85" x 8.24"
5.30" x 7.47" and 4.82" x 6.79"
4.34" x 7.77" and 3.83" x 6.86"
4.42" x 7.74" and 3.90" x 6.83"
6.13" x 11.74" and 4.91" x 9.39"
4.62" x 7.80" and 4.05" x 6.85"
4.53" x 7.81" and 3.97" x 6.85"
6.44" x 11.72" and 5.16" x 9.40"
4.31" x 7.83" and 3.78" x 6.88"
6.38" x 11.70" and 5.13" x 9.41"
3.37" x 7.19" and 2.97" x 6.34"
6.11" x 10.61" and 5.13" x 8.90"
6.33" x 10.71" and 5.32" x 8.99"
4.41" x 7.46" and 3.87" x 6.55"
6.45" x 10.84" and 5.41" x 9.10"
6.90" x 11.21" and 5.78" x 9.40"
4.80" x 7.80" and 4.22" x 6.86"
5.85" x 9.38" and 4.26" x 6.84"
5.06" x 9.41" and 3.66" x 6.84"
5.79" x 9.28" and 4.27" x 6.86"
3.91" x 9.33" and 2.88" x 6.87"
5.12" x 9.40" and 3.74" x 6.85"
5.85" x 8.14" and 4.86" x 6.75"
4.18" x 9.32" and 3.07" x 6.86"
4.87" x 9.33" and 3.58" x 6.86"